The Realme 3 has a 6.2" LCD screen at the front of HD+ resolution - that's same size and pixels as the Realme 2. What's new is the smaller droplet-like notch, a departure from the iPhone X-like eyesore on the old model. The resolution stays the same at 720 x 1,520 pixels and so is the density of 271ppi - not the ideal sharpness, but still quite usable. These specs make for a trendy 19:9 screen aspect ratio. The display is protected with a Gorilla Glass 3, but there is also a factory-applied screen protector. Whether to keep it or not - that's up to you. The text is sharp enough though minor pixelization is visible here and there. The icons on the homescreen are somewhat blurry because of the low resolution, too. But while the screen isn't obviously sharp enough to compete with the best, it's sharp enough for this budget class. 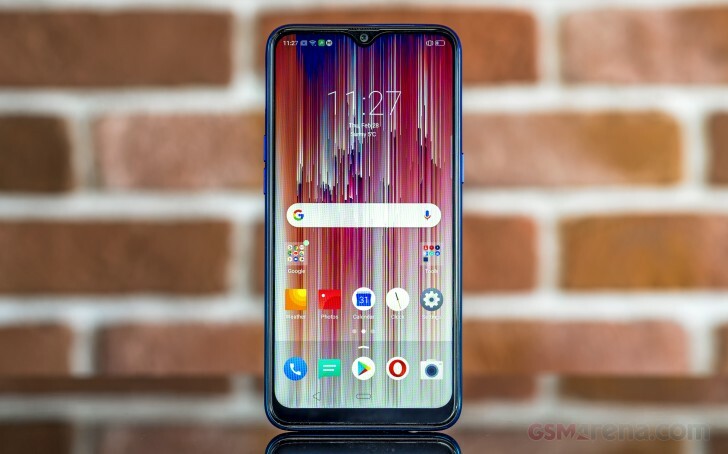 The Realme 3's display has a maximum brightness of 385 nits - that's below the average even for this class but will do mostly fine in all but the brightest of days. The black levels turned out quite deep, though, so the Realme 3 screen scored an excellent contrast ratio of 1460:1. For those following our tests closely - the lower brightness we could achieve on the Realme 3 is 1.8 nits, which is dim enough for comfortable use in the dark. The sunlight contrast number is far from ideal for the Realme 3 screen, but it still means the display is still usable outside when the brightness is set to maximum. The color rendering is average - the screen offers mostly accurate colors and we measured an average DeltaE of 5.3. The representation of the white color is way colder than it should be (DeltaE of 9.4). If you opt for the Warm color saturation from Settings, the blue tinge is suppressed and the average DeltaE drops to 3.4 - an excellent result for the class. The Realme 3 is powered by a large 4,230 mAh battery - that's the same capacity as the Realme 2 had under its hoot. The battery supports regular 5V/2A charging and the bundled 10W charger restores about 23% of the battery in 30 minutes and 30% in 40 minutes. Not exactly fast, but as fast as you can expect in this price segment. The Realme 3 scored an excellent result in our battery test with a 108-hour Endurance rating. It did a great job in all tested scenarios - video playback, calls, web browsing and even stand-by performance. It scored better than the Realme U1, which has the same chipset, thanks to its larger battery. Our battery tests were automated thanks to SmartViser, using its viSer App. 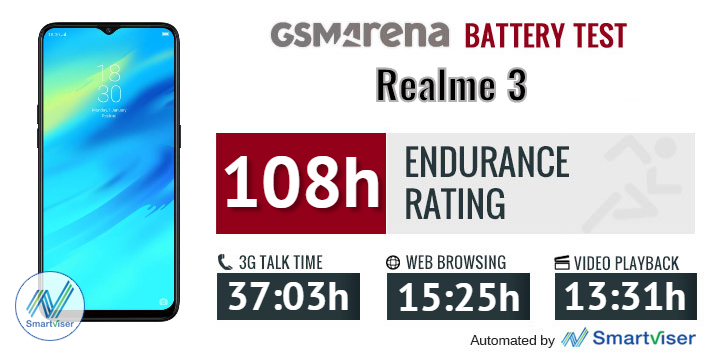 The endurance rating above denotes how long a single battery charge will last you if you use the Realme 3 for an hour each of telephony, web browsing, and video playback daily. We've established this usage pattern so that our battery results are comparable across devices in the most common day-to-day tasks. The battery testing procedure is described in detail in case you're interested in the nitty-gritty. You can check out our complete battery test table, where you can see how all of the smartphones we've tested will compare under your own typical use. The Realme 3 has a single bottom-firing speaker at its disposal, just like the Realme 1 and 2. Stereo might be out of the question, but the speaker can still put on a good show, even in the budget segment. Just as promised, the speaker is indeed tuned to focus on the mid-tones, but no matter the kind of music you are playing, it indeed sounds pretty good. 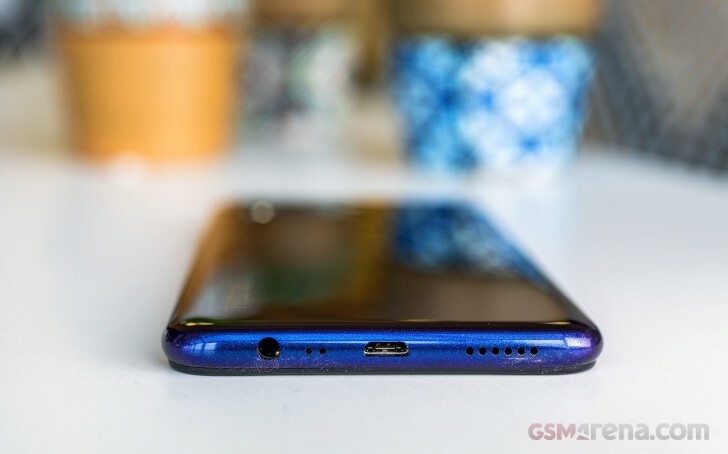 The active external amplifier part of our audio quality test saw the Realme 3 deliver a great performance - clarity was perfect and volume was very high. Headphones caused a big plunge in loudness though - to average levels. Stereo crosstalk rose an average amount and some intermodulation distortion crept in. A rather mediocre showing by the Realme 3 here in the grand scheme of things, but adequate considering its price range.